Through all the years I’ve been traveling around Europe, one of my greatest joys continues to be taking a walking tour of Paris. There are so many places to visit in Paris I never tire of the city. I know, however, that many travelers don’t have the luxury of spending a week or two in the French capital. Many of us, myself included, cram so much into a European trip that we wind up spending only two days in Paris. That’s not an altogether bad thing, however. Two days in Paris are better than none, and you’ll likely return again and again. If you don’t, shame on you. On my walking tours of Paris, I sometimes search for new places, other times I just enjoy the old haunts. And each of my Paris itineraries has shown me fascinating facets of the city – even if I only had two days in Paris. From my experience, I’ve culled a two-day walking tour of the best places to visit in Paris. These are two full days, meaning you should spend three nights in Paris. This post includes a map of Paris, showing you the best routes to make good use of your time. In fact, there’s two maps of Paris, one for each day. Although they are maps for a walking tour, you may want to take the Metro or a taxi from Montmartre to the Arc de Triomphe de l’Étoile since the distance is long. The same goes for a walk from the Musée d’Orsay to the Jardin du Luxembourg (Luxembourg Gardens). This map depicts a walking tour of the places mentioned in this article. It can all be covered in two days in Paris. It is interactive; press +/- to enlarge it or make it smaller. It can also be viewed, and the route followed, on your smartphone. 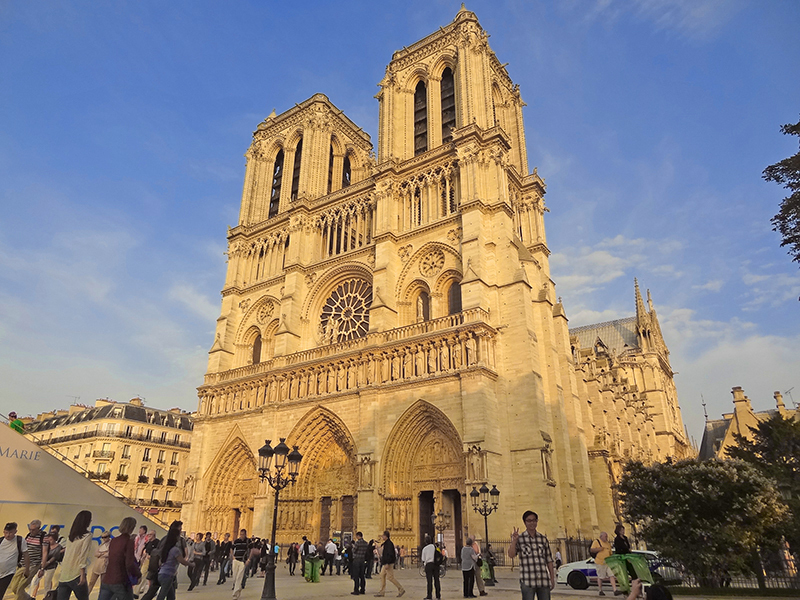 A stop on all Paris itineraries, Notre-Dame de Paris is as beautiful as it is historic. Located on the Île de la Cité in the Seine, it’s now more than 850 years old and attracts 13 million visitors every year. Be one of them, and you’ll discover an incredibly beautiful church, unlike any other. 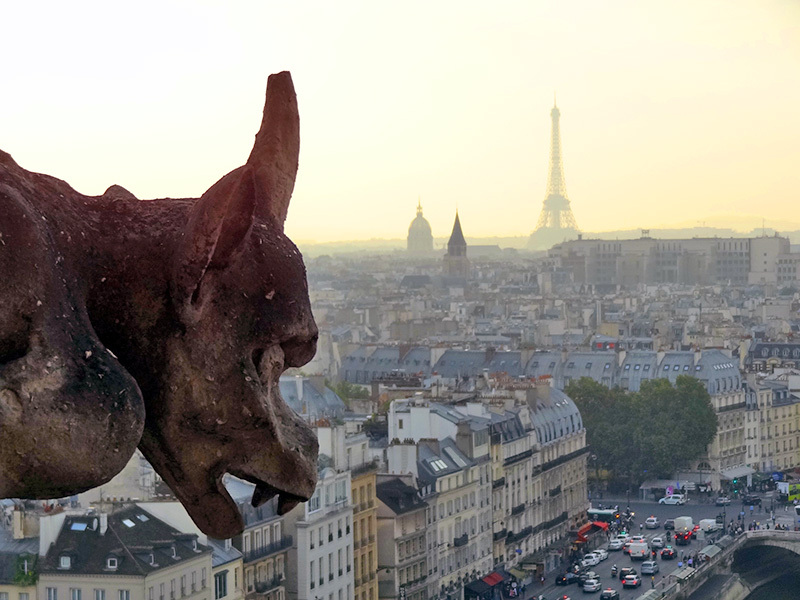 If you have the stamina, climb the 387 steps to the roof of the north tower for a superb view of Paris and the cathedral’s famous gargoyles. The last time I visited I was enchanted by a boy’s choir in rehearsal, as their voices drifted through the air of the magnificent cathedral. Opening hours: Monday–Friday 8a.m.–6:45p.m. ; Saturday and Sunday 8a.m.–7:45p.m. 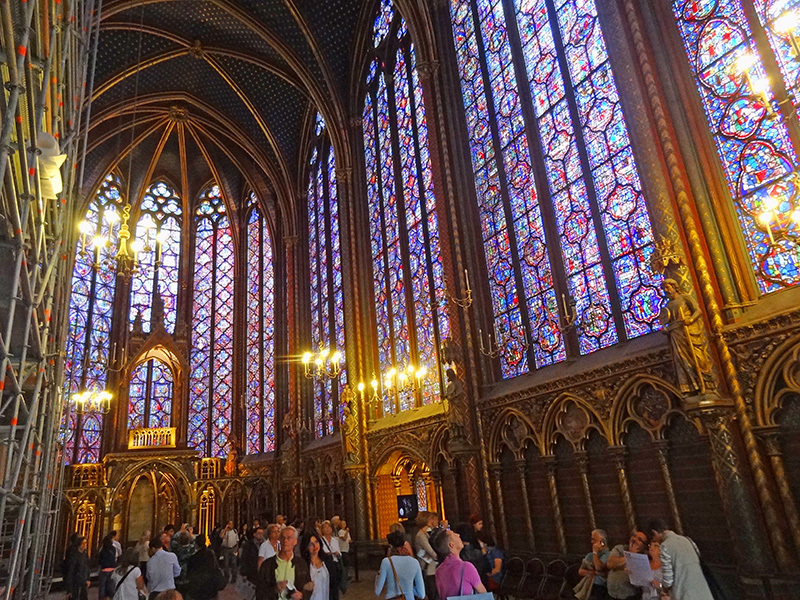 Follow your map to Sainte-Chapelle, which is missed on some short Paris itineraries. But take some time to see it, especially since it’s so close to Notre Dame. It was built in the 13th century by Louis IX as a repository for holy relics (now in Notre Dame) that he had acquired from the Emperor of Constantinople. It’s claim to fame, however, are its magnificent 1,113 stained-glass windows, the oldest in Paris. They are what has made it one of the top 10 places in Paris, and are as extraordinary as they are magnificent, soaring glass walls that the ceiling above appears to float over. It is an amazingly beautiful place, the most stunning Gothic monument in all of Paris. It’s housed within the Palais de Justice, which requires visitors to transit a security area as they enter. Try to visit on a sunny day to get the full impact. Opening hours: January 2–February 29: Monday–Friday: 9 a.m.–1 p.m./ 2:15 p.m.–5 p.m.; except Tuesday–9 a.m.–1 p.m./ 2:15 p.m.–5 p.m. Saturday–Sunday: 9 a.m.–5 p.m.
July 1–August 31: Monday–Sunday: 9:30 a.m.–6 p.m.; except Wednesday: 9:30 a.m.–12:45 p.m. / 2:15 p.m.–9:30 p.m.
November 1–December 31: Monday–Friday: 9 a.m.–1 p.m./2:15 p.m. – 5 p.m.
Saturday–Sunday: 9 a.m. – 5 p.m. Admission: Adults: 10 €. Free entry with the Paris Pass and Paris Museum Pass. 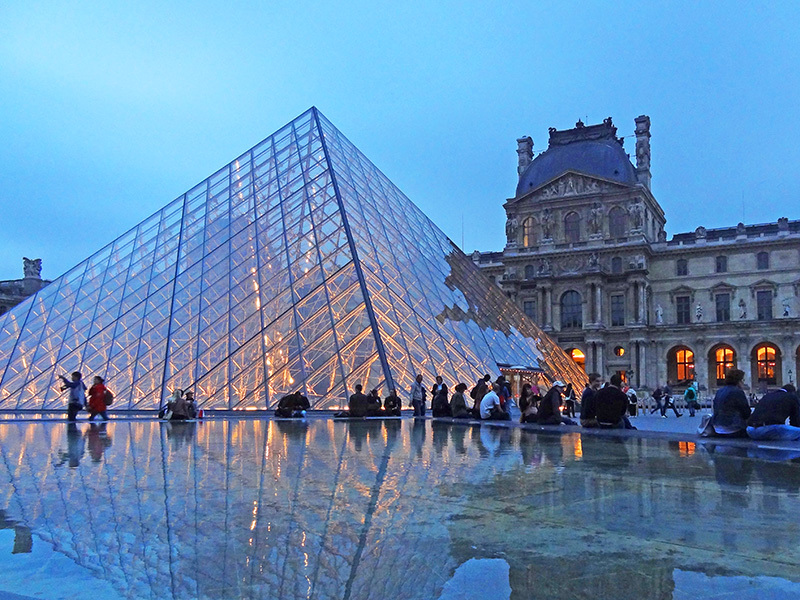 The third stop on your Parisian route is the Louvre, the pièce de résistance of the museum world. 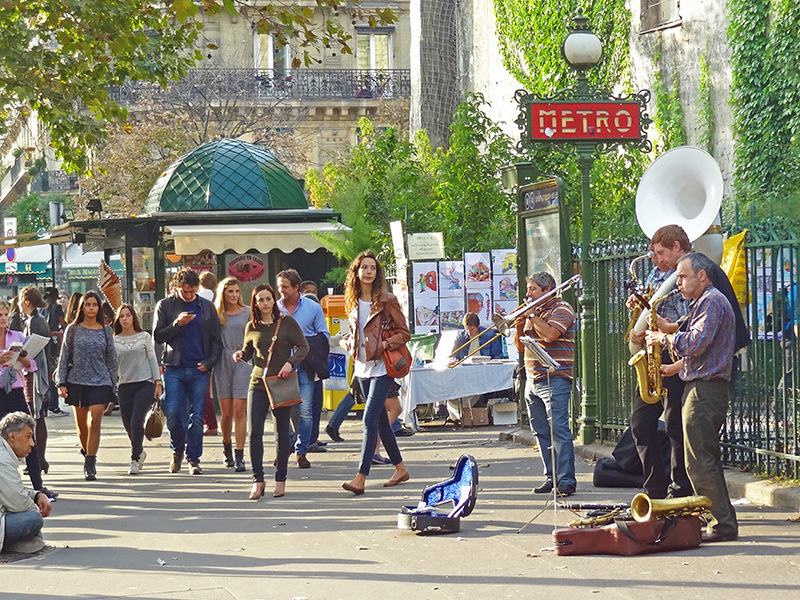 It’s firmly entrenched as one of the must-see places to visit in Paris for most travelers. Although best known for the Mona Lisa and her enigmatic smile, it’s an incredible repository of more than 75,000 pieces of art from almost every civilization on earth (it’s estimated it would take nine months just to glance at every piece). Its works are spread out over 675,000 square feet in three different wings, with their entrances located under I.M. Pei’s glass pyramid in the courtyard. It’s best to go online to buy your tickets and select the areas you’d like to see ahead of time. Opening hours: Monday, Thursday, Saturday, Sunday: 9 a.m.–6 p.m. Wednesday and Friday: 9 a.m.–9:45 p.m. Closed Tuesdays. Depending on how much time you spent in the Louvre (or how tired you may be), at this point you now have a choice of two places to visit in Paris. Distance: The center of the Marais is just a few minutes from the Louvre (turn right on Rue de Rivoli as you exit the museum). See the attached Paris map. You’ll now walk along the chic Rue de Rivoli into the beautiful Marais district north of Notre Dame. 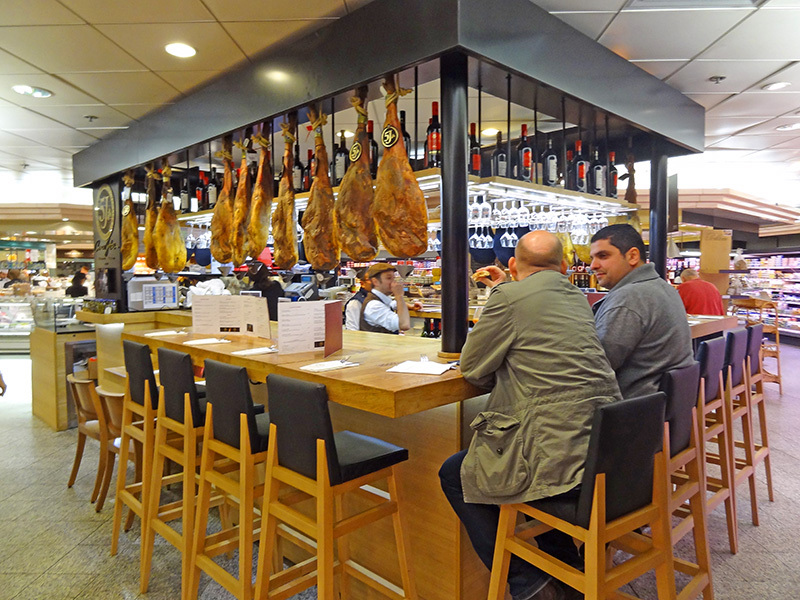 It’s a beautiful area filled with mansions and several small but notable museums, as well as many popular cafés and restaurants peppered along its little lanes. Encompassing the 13th-century Jewish Quarter, today it’s one of the liveliest nightspots in the city. Distance: a 20-minute stroll through the Jardin des Tuileries to Concorde; an addition 20 minutes to Galleries Lafayette. When you exit the Louvre follow the map’s route and walk through the adjacent Tuileries Garden to the beautiful Place de la Concorde. While you’re there, wander into the lobby of the incredible Hotel de Crillon, one of the most famous luxury hotels in the world. Room rates start around $1300 per night, and its Les Ambassadeurs bar offers more than 100 kinds of Champagne. From here I suggest you take a 20-minute walk up to Galleries Lafayette (35 Boulevard Haussmann), a beautiful department store with fine fashion and fabulous food. Yes, food. It has restaurants, bars, and take-way. You’ll see plenty of French doing their food shopping there. This map depicts a walking tour of the places mentioned in this article. It is interactive; press +/- to enlarge it or make it smaller. It can also be viewed, and the route followed, on your smartphone. The Romano-Byzantine church of Sacré-Cœur, completed in 1914, isn’t as old as other Parisian churches but is better known due to being a Parisian landmark visible from many areas of the city. It stands on top of the hill of Montmartre, an area of Paris that was once a village outside the city. 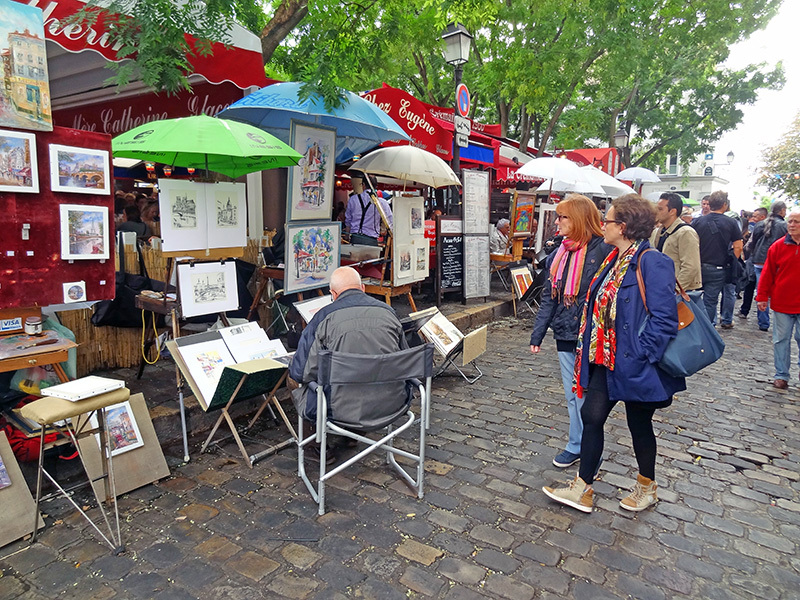 For centuries it’s been the haunt of artists, something that continues today as scores of them showcase their paintings for tourists in the bustling Place du Tertre. Yes, it’s touristy, but it’s fun and colorful and still retains the aura of pre-war Paris. You can reach it via Metro (the stop will be either Anvers, Abbesses, or Lamarck Caulaincourt, depending on the line). From the Metro there’s a walk of a few short blocks and then steps up the hill to reach Sacré-Cœur. Opening hours of Sacré-Cœur: daily 6 a.m.–10.30 p.m.
On your second day in Paris you’ll want to visit the triumphal arch, the Arc de Triomphe, was built to celebrate Napoleon’s victory at the Battle of Austerlitz in 1805. It is firmly entrenched as one of the top 10 places in Paris. 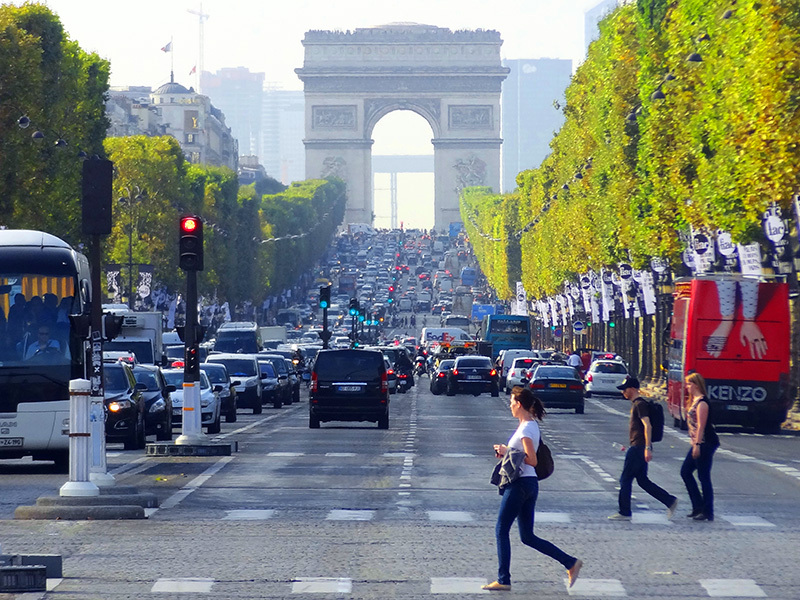 The customary starting point for parades up the Champs-Élysées, the arch stands in the center of the hub where 12 avenues converge, a nightmare for unsuspecting out-of-town drivers. The viewing platform on its roof provides one of the best views of the city, the only place to get a good view of both the Eiffel Tower and Champs-Élysées. Opening hours: January 2–March 31 and October 1–December 31, 10 a.m–10:30 p.m. April 1–September 30, 10a.m.–11p.m. Distance: a 20-minute walk to Jardins du Trocadéro; an additional 10 minutes to the Eiffel Tower. When you leave the Arc de Triomphe, don’t head straight for the Eiffel Tower., the most popular must-see in Paris. Instead follow the map and walk over to the Trocadero Gardens, on the Seine directly across from the Tower. Stop here for your group photo or selfie before taking the short walk across to the Tower. This is the best place to take pictures of the Tower. (It’s also the best place to view the nightly illumination). Of course, no walking tour of Paris is complete without a stop at the Eiffel Tower, one of the top places to visit in Paris. It stands proudly along the Seine on the Champ de Mars and remains the most enduring symbol of Paris. Everyone has to see it, even if you only to stand below to view its soaring arches, although the sights from above are much better. There will be crowds queuing at the tower from opening to closing, so it’s well worth getting tickets online in advance. If you’re hungry, you’ll find its Jules Verne Restaurant in the tower to be one of the best in Paris, although don’t even think about it if you’re on a budget. 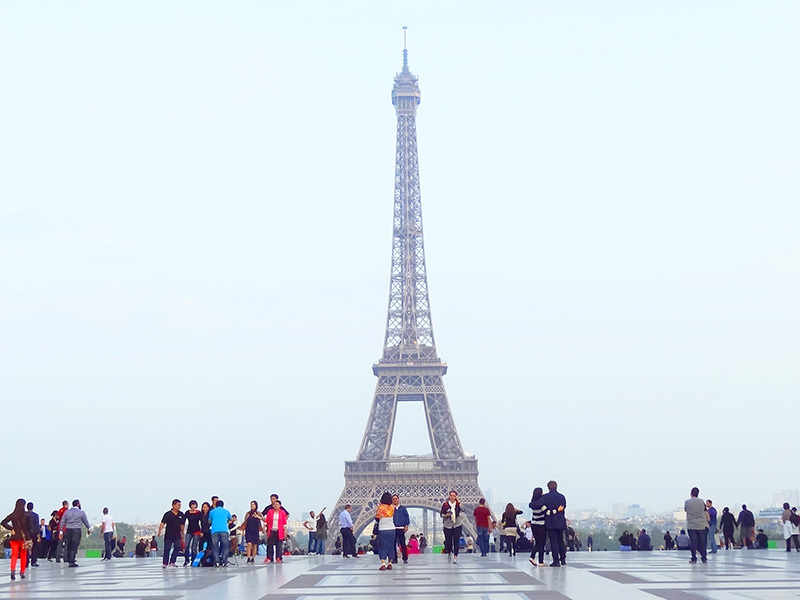 Opening hours: Trocadero: 24 hours per day; Eiffel Tower: June 21–September 2: 9a.m.-12:45a.m. ; remainder of year 9:30a.m.-11:45p.m. Admission via lift: to 2nd floor: Adults €16, 12-24 years €8, 4-11 years €4; to top of the tower: adults €25, €12.50, €4.80. Stair tickets to the 2nd level are approximately 40% less. 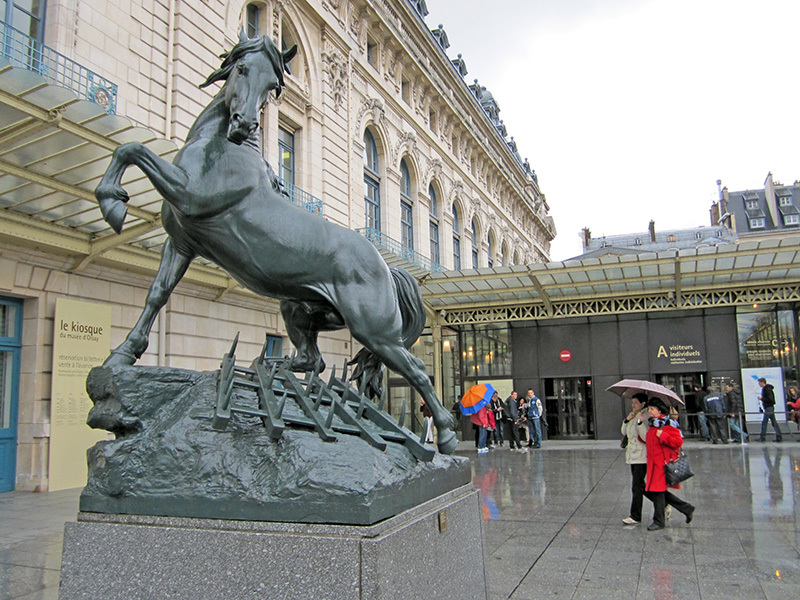 Now follow your route map to the Musée d’Orsay, which from a collector’s perspective takes over where the Louvre leaves off, exhibiting pieces from 1848 to 1914. It’s a superb museum that was born as a Belle Époque railway station in the 19th-century and was given a second life in 1986. It’s world renown for its collection of Impressionist and Postimpressionist paintings, with works by Renoir, Monet, Van Gogh, Manet, Degas, and Cézanne. It’s a comfortable and easy-to-see museum with exhibits spread about three floors. You’ll spend much less time here than you did in the Louvre but it should be on your list of places to visit in Paris. Admission: Adults €12; for non-EU 18-25-year-olds and everyone after 4.30pm (except Thursdays) and 6p.m. Thursday €9. The museum is free the first Sunday of the month. Don’t miss following your map to beautiful Luxembourg Gardens is one of the top parks in the world. 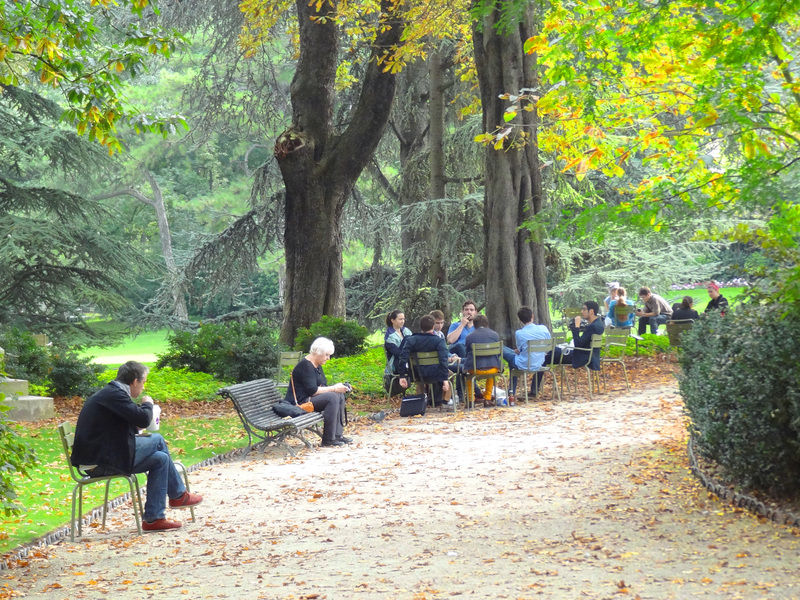 You don’t find it on many self-guided walking tours of Paris, but it’s a treat to visit these beautiful, quiet gardens that are surprisingly close to the hustle and bustle of St-Germain-des-Prés. Make it one of your must-sees in Paris. This green oasis is the most popular parks in all of Paris, a refuge filled with spacious lawns and paths beneath towering chestnut trees. In its center is the beautiful Luxembourg Palace with an octagonal pool where children sail their toy sailboats, which are for rent at the nearby kiosk. The beautiful 60-acre park has both French and English gardens with more than 100 statues spread throughout it. Opening hours: the park varies its opening/closing time according to the season. Opening ranges from 7:30 a.m.– 8.15 a.m., and closing from 4:30 p.m.–9:30p.m., according to the season. When you exit the gardens on Boulevard Saint-Michel, follow your route map since you’re only a few minutes walk from the Panthéon, which many travelers bypass if they just have two days in Paris. But you’re so close to it now it’s well worth seeing. 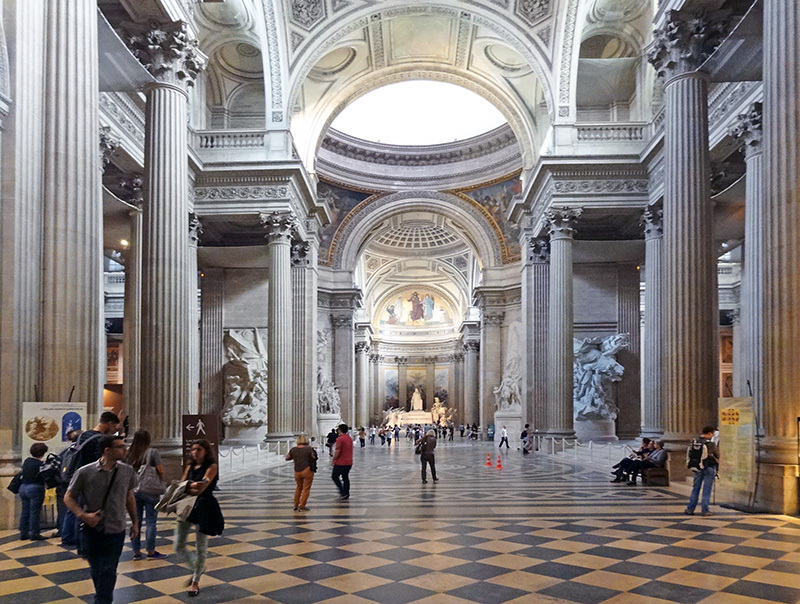 Modeled after its namesake in Rome, the neoclassic Panthéon originally was constructed as Sainte-Genevieve Church, in honor of the patron saint of Paris. Its life as a church was short-lived, however, since it was completed right before the French Revolution, and the revolutionary government converted it into a mausoleum. Its 220-foot-high dome is so extraordinary that Foucault used it to test his famous pendulum, proving the Earth rotates on its axis. It is a beautiful and stately building, whose “residents” are a “Who’s Who” of French history. They include such luminaries as Voltaire, Rousseau, Victor Hugo, Emile Zola, Louis Braille, and Marat. The ashes of Marie Curie were moved here in 1995, more than 60 years after her death. Opening hours: January 2–to March 31 and October 1–December 31 10:00 a.m.–6:00 p.m. April 1–September 30 10:00 a.m.–6:30 p.m. Open every day except January 1, May 1 and December 25, and the morning of June 17. 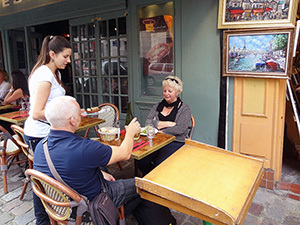 When you leave the Panthéon return to Boulevard Saint-Michel and follow your map back toward the Seine into the heart of teh Latin Quarter, another of the must-sees in Paris. 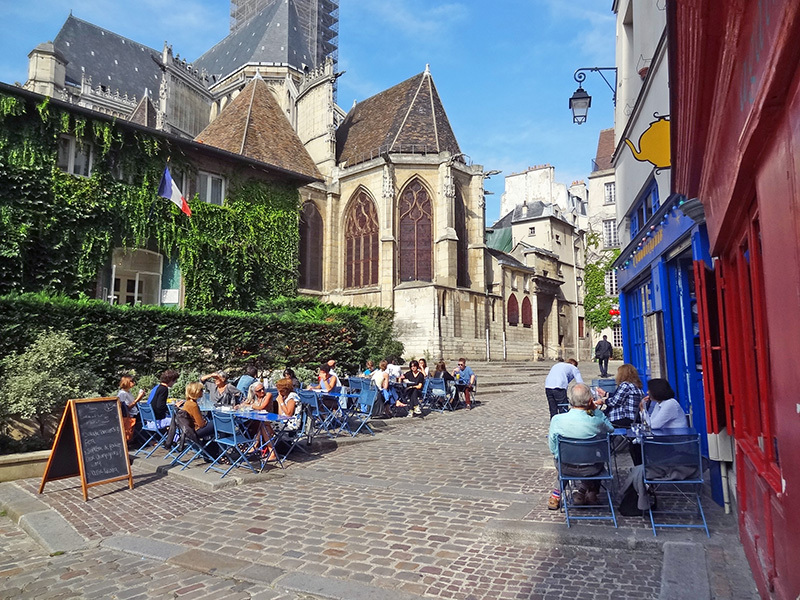 It’s an easy 15-minute walk that you’ll find on most Paris itineraries, but it likely will take you longer as you enjoy the sights along the way. Now you’ve reached the end of your second day in Paris. End your walk, put away your map, and stop in a café or restaurant for a drink and dinner.